Reviews are a tricky thing for authors. We’re told not to read them – but it’s hard no to! Which means we sometimes see the occasional bad or strange one, and no one likes that! But if we are going to look, we have to take the bad ones on the chin. But also, if we do look (and I’ve been very lucky – so far!) we might see a review which brightens our day – or even week – and is a pure joy to read. I had one of those recently from a young reader called Sophie, who has started a blog about books. 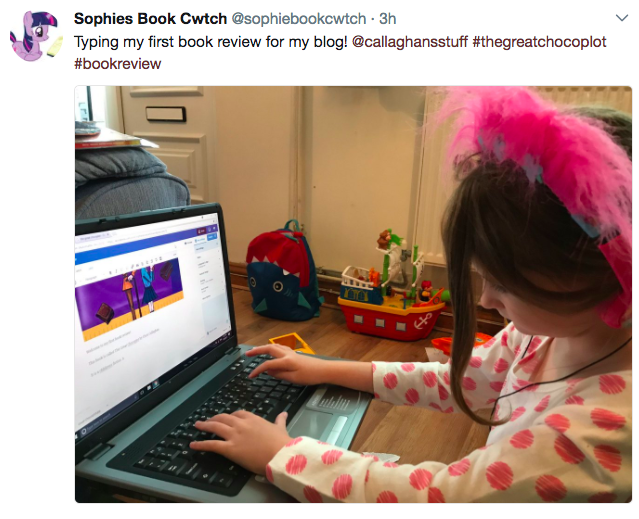 I had the honour of being Sophie’s first book review on that blog. Luckily, it isn’t bad or strange, but completely wonderful. You can read it here. Thank you, Sophie, for taking the time to read my story. I’m delighted that it made you (and your mummy!) laugh – that makes me very happy. And thank you for writing such lovely and thoughtful words. It’s also a great idea that you include your favourite quotes too! I hope you enjoy reading many more books. This is why I will (occasionally) dip into my reviews. Lovely comments from grown-up booky people are always welcome (stars on Amazon are also welcome too, hint, hint *ahem*!! ), but a kind review from a proper reader is the best thing EVER!! !